Besides fun activities and beautiful beaches, Bintan Island also offers lots of dining experiences with lots of different cuisines to choose from – perfect for food lovers hoping to embark on a gastronomic adventure during this getaway. The Kelong seafood restaurant, located at the western coast of Nirwana Gardens, offers a panoramic view of the South China Sea and the luxurious Indra Maya villas. This is one of the best places on Bintan Island to have dinner as you get to catch the beautiful sunset while you dine by the sea and right after dinner, you can head straight to the Calypso bar for some drinks and relax to the tune of reggae music. Built on stilts just above the sea, the Kelong offers a unique blend of Chinese and Indonesian food. The seafood on offer e.g. black pepper crabs and cereal prawns does not come any fresher as some of them are caught right off the waters around the Kelong! Discard any preconceptions of cramped, dirty, hot kelongs as the Kelong restaurant is spacious (with capacity to seat 400 guests in the main area) and clean. You can also enjoy the cool sea breeze while you savor the seafood dishes. Besides seafood, there are also chicken and vegetable dishes in the menu. 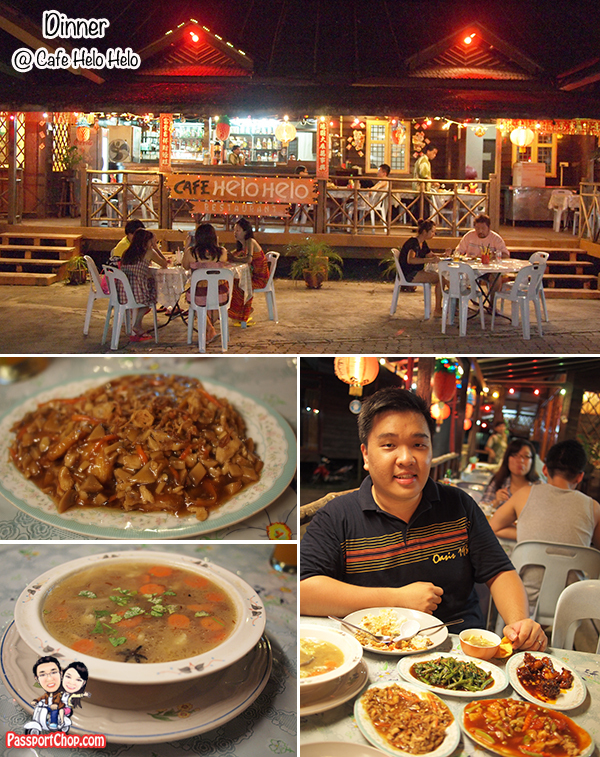 A meal at the Kelong restaurant for 2 comprising prawns, vegetables, chicken dishes will cost about 60-70 SGD. To get to Kelong restaurant, hop on to one of the Nirwana Gardens Resort shuttle bus (free) and ask the driver to inform you upon arrival at the Kelong (but you won’t be able to miss this big kelong – the only one along the shuttle bus route). 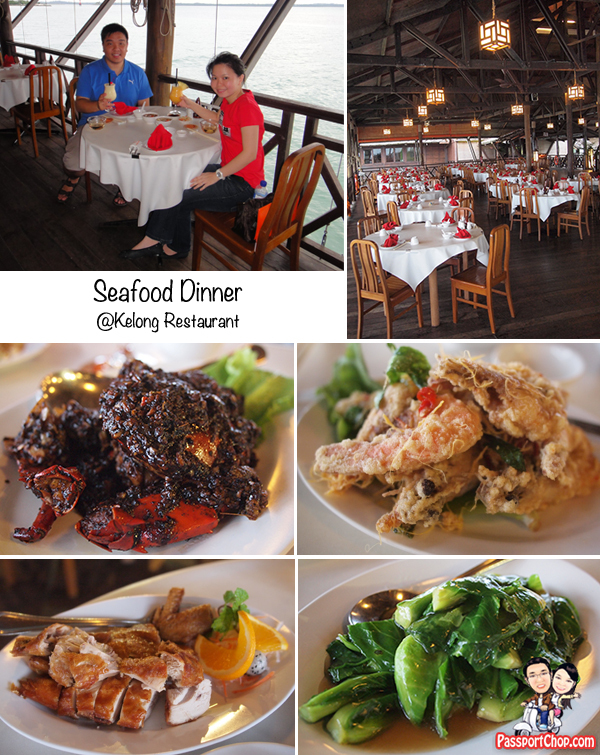 The Kelong restaurant is open daily from 11am to 10.30pm. Located at Pasar Oleh Oleh – a food and shopping hub set against a rustic kampong backdrop just outside the resort area, Cafe Helo Helo is well-known for its good and reasonably priced food. The corny name (“Helo” is actually “Oleh” in reverse) aside, Cafe Helo Helo’s food actually reminds me of those served by tze-char stalls in Singapore kopitiams (coffeeshops). The stir-fried tofu & seafood was one of the best dishes we tried – with generous servings of fresh ingredients e.g. prawns, vegetables and fried egg; not surprisingly, it is also one of the more expensive dish on offer (about 15 SGD) but well worth it especially for sharing. The other dishes on offer include satay, otah otah, BBQ chicken wings, deep fried fish, sambal kangkong, mee goreng, bee hoon etc. – as can be seen, very typical Singaporean tze-char fare – so if you miss Singapore food, Cafe Helo Helo is the best place to turn to while you are here in Bintan. Things are generally cheaper here at Pasar Oleh Oleh than in the resorts so stock up on your water, snacks and souvenirs here. Food at Cafe Helo Helo is also considerably cheaper than resort restaurants. Sometimes, a singer will perform a song or two (usually old songs) at Cafe Helo Helo and will take requests from dinner guests. He is truly talented – even able to sing mandarin songs such as Teresa Teng’s famous song – 月亮代表我的心 (he is not Chinese but was able to catch the tune and pronunciation perfectly!). So for a affordable dining experience in a relaxing ambiance at a great location (with quick access to shopping in Bintan), Cafe Helo Helo is your best bet! To get to Pasar Oleh Oleh, hop on to the Pasar Oleh Oleh shuttle bus from the Nirwana Resort Hotel. The Pasar Oleh Oleh shuttle bus pass allows unlimited rides for a day at a cost of $5.00 per Adult and $3.00 per Child. Cafe Helo Helo is located right in the centre of Pasar Oleh Oleh, near the minimarts. 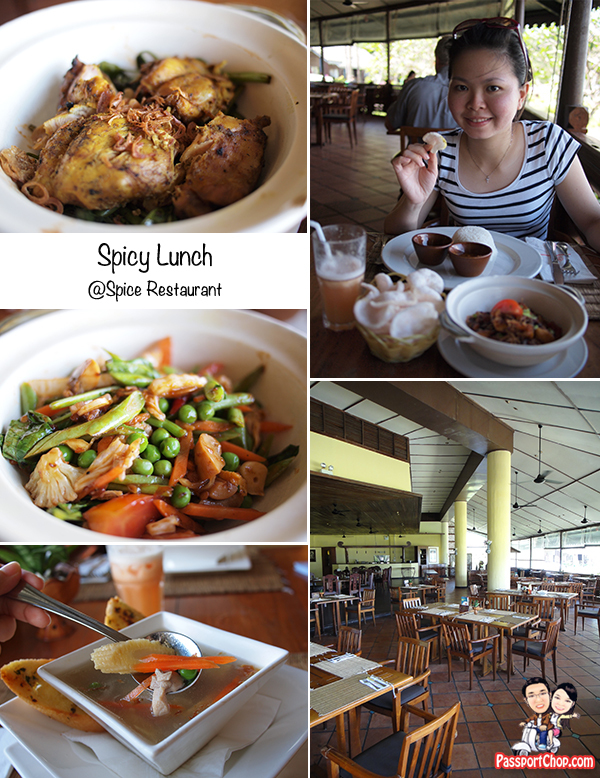 The Spice Restaurant at Mayang Sari offers a lovely view of the beaches and specialises in Indonesian and Indian food. As its name suggests, some of its lunch dishes can be very very spicy. If you can’t take spicy food, I strongly recommend for you to avoid ordering these dishes together as they can be quite a potent spicy combination! If you like Indian food e.g. briyani, tandoori, the Spice restaurant would be your best bet for such dishes. To get to Mayang Sari Spice restaurant, hop on to one of the Nirwana Gardens Resort shuttle bus (free) and ask the driver to inform you upon arrival at Mayang Sari resort. Of course, if you are staying at Mayang Sari resort, simply walk over to the lobby; the Spice restaurant is just located beside it. 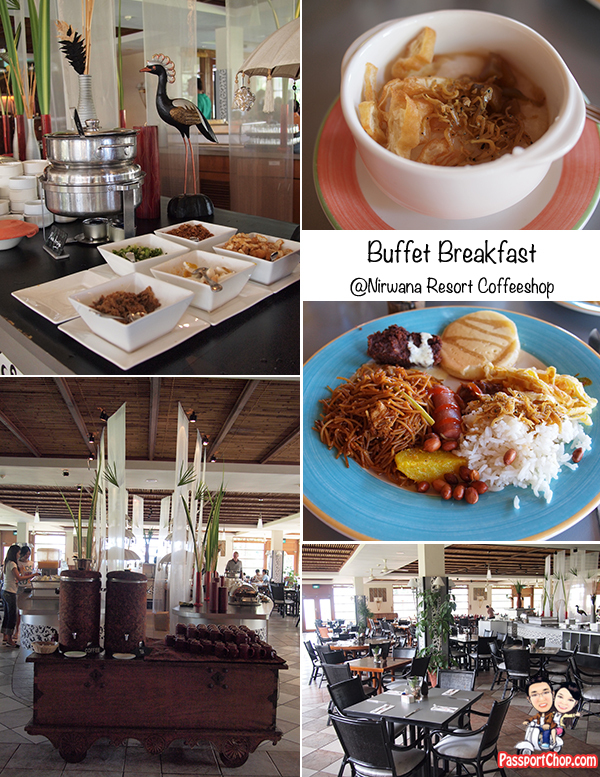 If you are staying in Nirwana Resort Hotel, you are in for a treat for the Coffee Shop’s international breakfast buffet spread. There are lots on offer from Asian delights e.g. nasi lemak, bee hoon to a full English breakfast e.g. bacons, ham, sausages and there is also a wide array of pastries e.g. croissants and muffins – just what one would expect from a hotel breakfast. Besides breakfast, the Coffee Shop also offers a lavish daily spread of Oriental buffet lunch (SGD 26++) and International buffet dinner (SGD 34++). There is also a iguana mini-zoo just beside the Coffee Shop – their feeding time is at 8am so drop by before/during your breakfast to see them in action having their breakfast (although their meals are not as lavish as yours – just vegetables). For guests at other resorts within Nirwana Gardens, to get to the Coffee Shop, hop on to one of the Nirwana Gardens Resort shuttle bus (free) and ask the driver to inform you upon arrival at Nirwana Resort Hotel. The Coffee Shop is located one floor below the lobby. Planning a trip to Bintan for a quick getaway? Check out this post http://www.passportchop.com/trip-summaries/bintan-weekend-getaway/ for exclusive discounts (only for PassportChop.com readers) for Nirwana Gardens Resort stay, Spa packages and Mangrove tours. Wow, I wanted to have also a spicy lunch..I used to be person who likes hot and spicy food. Whenever it is too hot and when the sun is so high in the sky I’m craving for foods like that. Thanks by the way for blogging those foods.Yum-yum! Thank you sharing so much information on Bintan island. I always thought it is just an up market place for SPA. Your food photos are really tempting that I will definitely consider going to Bintan again next year. Hopefully, can get a good deal from the forthcoming Natas Fair 2012. Awesome info whenever any visitor go to any new place for spend his/her vacations then two things are become big challenge for him/her and these two things are where you will stay and what will to eat there. But you help lot in this case because all variety is available there with mouth watering food. I always thought it is just an up market place for SPA. Your food photos are really tempting that I will definitely consider going to Bintan again next year. Wow!! I want to go in this place..I like the ambiance and the foods sounds delicious..Thanks for sharing this to us..
A person produced some great elements there. I think most individuals will concur along with your website. Nice posts. Makes me hungry, especially those pictures featuring spicy foods and those i Kelong resto. this is definitely making me very hungry !! Great article! garam masala and tandoori spices for making chicken tikka masala and it was pretty spot on. It’s tough to find freshly ground kashmiri chiles and other high quality hard to find spices. Look forward to receiving next month’s spice blends from them and worth looking into if you’re an adventurous cook.